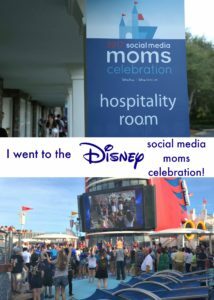 I've been on two Disney cruises are part of the Disney Social Media Moms Celebration, which is an invite-only conference for bloggers and social media influencers. I paid a fee for the conference and my travel to Orlando. This post is not sponsored by Disney and everything is my honest opinion. 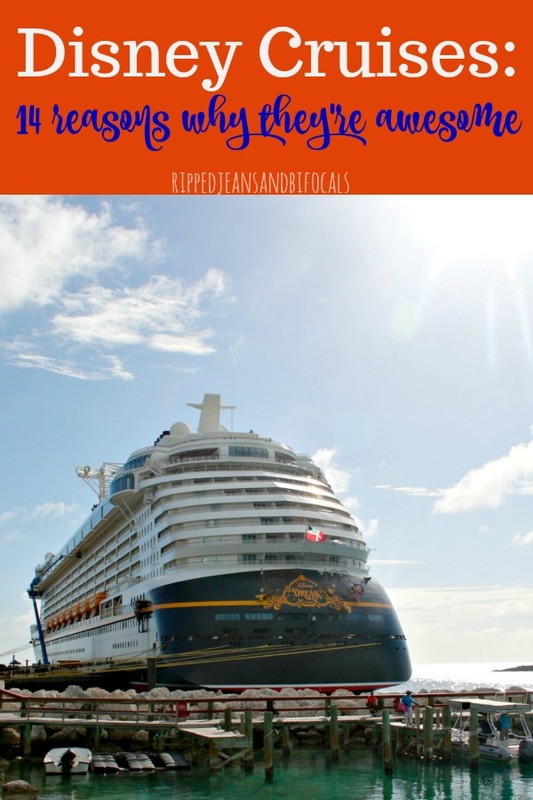 Get your free guide to planning a cruise with kids! If you’ve ever been on a cruise, you know the feeling of “following the herd” when you board the ship. A Disney cruise is different. Maybe we were just lucky that everything went smoothly and seemed un-rushed but I think that’s just Disney’s way of doing things. 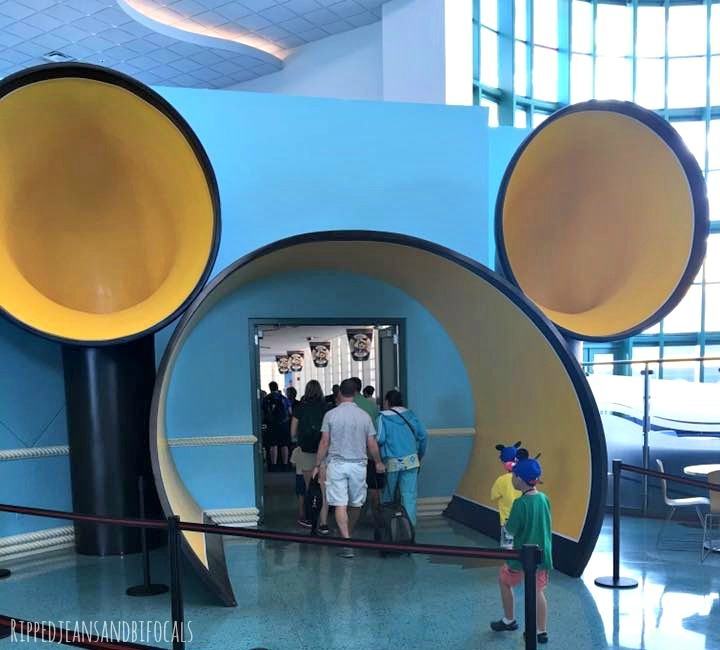 The Mickey ears at the entrance to the ship in Port Canaveral set the tone…and it only gets better from there. When we stepped on board the ship, the Cast Member inside asked us our family’s last name. “Robbins” we said without questioning why. I mean…it seemed like a simple enough question. This was shouted into a microphone and all the crew standing nearby clapped and cheered as we crossed the threshold. This immediately set the tone for the entire trip and also? Now I know what it feels like to be visiting royalty. The sail away party is an awesome, high-energy dance party that really gets you pumped about your vacation…if you’re not already there. There's music. There are pom poms. I know…someone doesn't look happy about holding the pom poms but he really was. 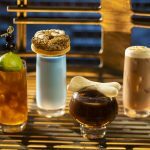 There are waiters walking around with fun and colorful drinks, both alcoholic and non-alcoholic. 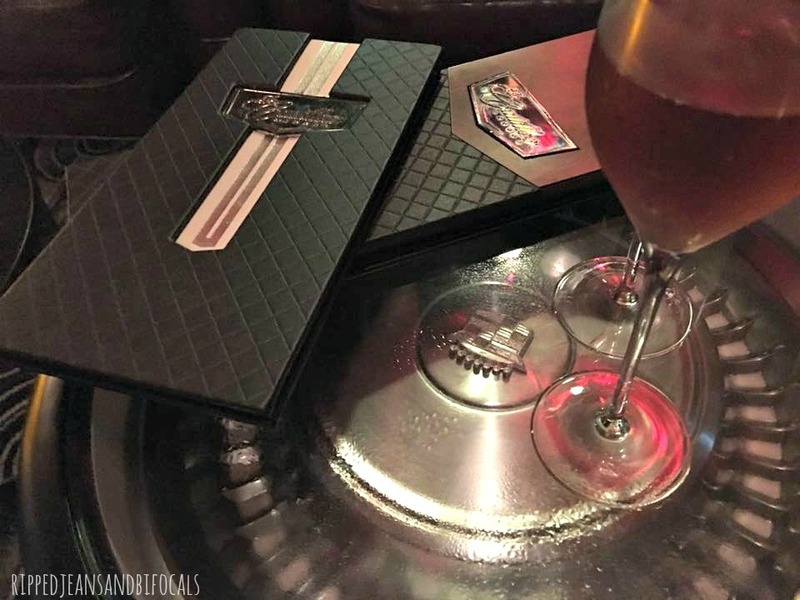 Just know that if you take the drink you will be asked for your Key to the World Card (AKA your stateroom key) and you will be charged. But go ahead and treat yoself. You’re on vacation! The Sail Away party is awesome and high energy. It makes everyone want to dance, especially a certain little boy in a green “The Good Dinosaur” shirt. Do you spot him? Castaway Cay (pronounced key) is Disney's private island in the Bahamas. It is seriously the most stunning place on earth and I've been to a lot of places. 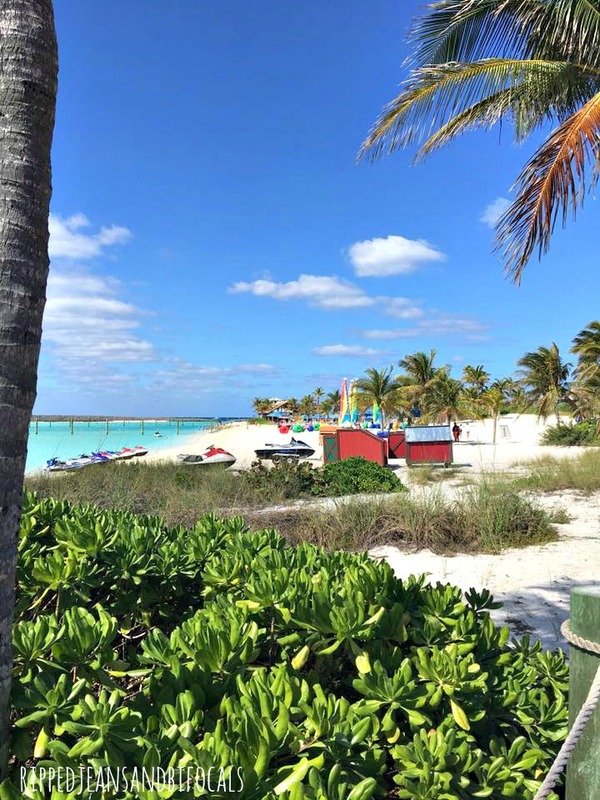 Castaway Cay has everything you'd want from an island experience: there are adventure sports like parasailing, snorkeling and scuba diving. There are glass bottom boat rides and sting ray experiences. There are two beautiful beaches – one is adults only, aptly named Serenity Bay. There are bikes to rent if you want to explore the island on wheels. There is food. 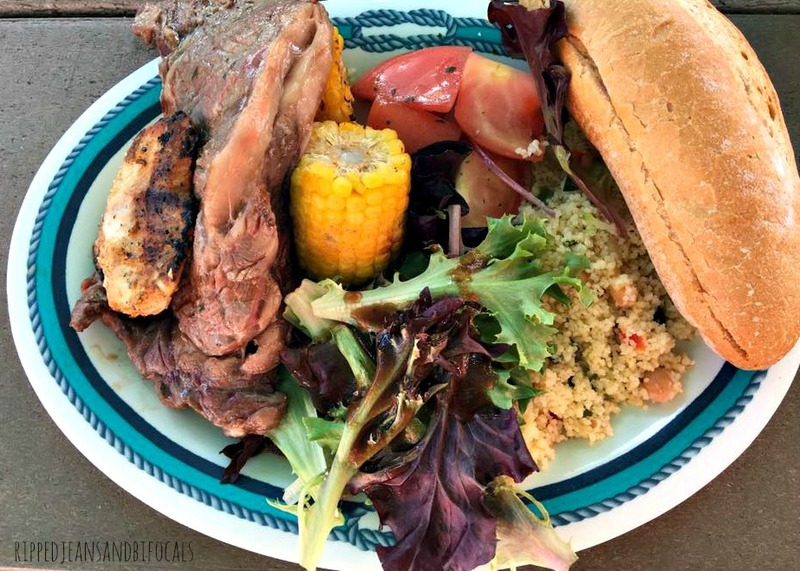 Cookies and Cookies Too (in the adults-only area) serves up a deliciously simple BBQ lunch buffet from 11:30-2:00, which is included in the cost of your cruise. Most cruise ship ports are not going to offer as many freebies as Disney's Castaway Cay. The food is awesome. And FREE! We live near the Texas Gulf Coast and we go there every July. While we love our Texas beaches, they're really not that pretty and it was a super big treat to wade in the crystal clear turquoise water where you could see all the way to the bottom. I've been scoping out different Disney Cruises (totally serious about wanting to go again as soon as we can swing it) and I've learned there are a couple of cruises that include TWO stops at Castaway Cay. Yes, please! There is Disney music everywhere. It’s very subtle and very tasteful and made me super nostalgic. 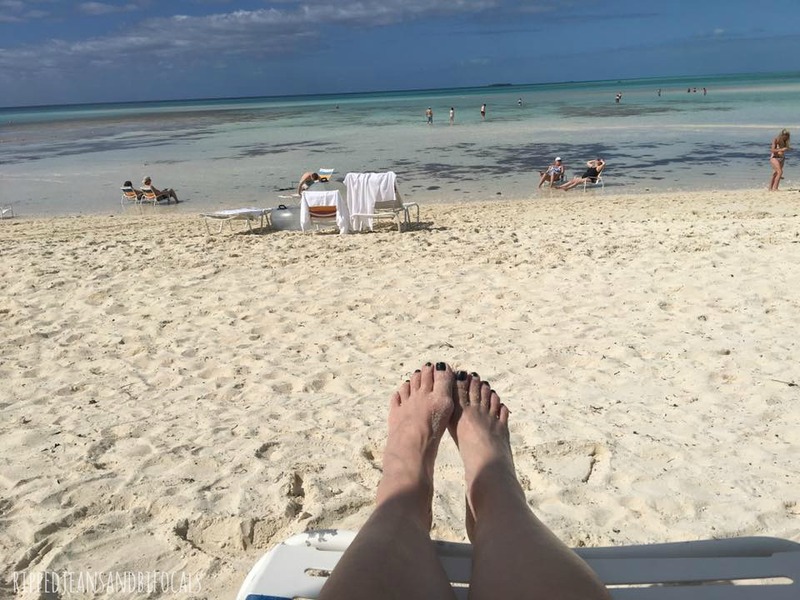 I think the most fun Disney music moment for me was when I was lying in my lounge chair at Serenity Bay (Castaway Cay’s adults-only beach) and realized that the guitarist was playing “Kiss the Girl” from the Little Mermaid, which is one of my favorites. There are Disney prints in all of the staterooms and common areas. 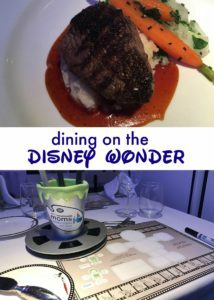 There's also Disney-themed art available for purchase on board, but my absolute favorite was the Animator's Palate, which is one of three restaurants on The Wonder. The walls are decorated with the beginning stages of Disney animation and there are all kinds of fun surprises with the decorations on the walls. You might even get a chance to have your artwork become a part of the show! I ate lunch at the Animator's Palate as soon as I came on board and it gave me a new appreciation for the talent that goes into making the films we all know and love and it was fun to see that artwork so prominently displayed on our cruise. 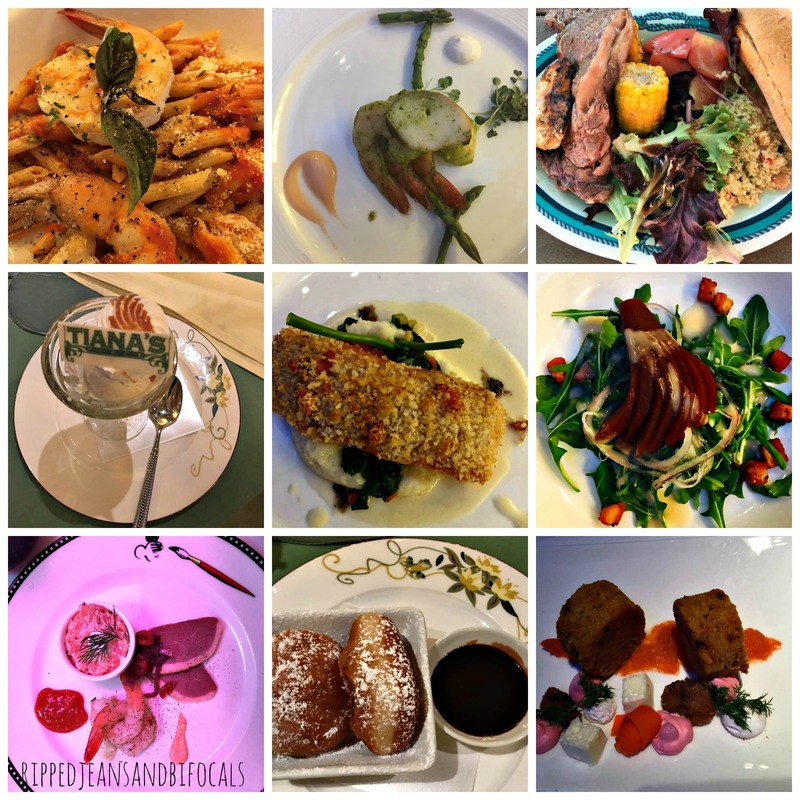 The food on the Disney Wonder was simply amazing. The number on the scale the day after I came home (eek!) confirms this but you know what? I don’t regret a single splurge. There are three restaurants and a casual dining buffet. There’s also Palo, an 18+ elegant dining experience that isn’t included in the cost of your cruise. We didn’t make it to Palo's but I did get to sample one of their dishes and it was delicious. I only heard good things about Palos and we’ll definitely check it out next time. Yes, I said next time because there will be one. You’ll rotate among the different restaurants during your cruise and your wait staff will follow you from place to place – how cool is that? 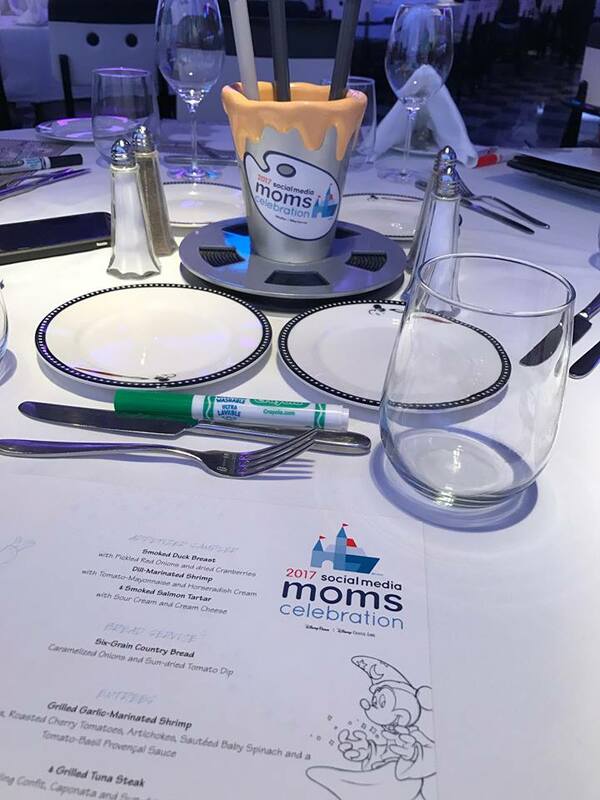 Since I spent a lot of time eating and taking pictures of my food during my cruise, I’m wrote an entire post about the Disney Social Media Moms Celebration…it tells you EVERYTHING you'll want to know about the food on board. There are endless options for your small humans on a Disney Cruise. The It’s a Small World Nursery is for kiddos ages six months through three years. Since our kids are older, I don’t have firsthand experience with this service but you can check out the specifics here. 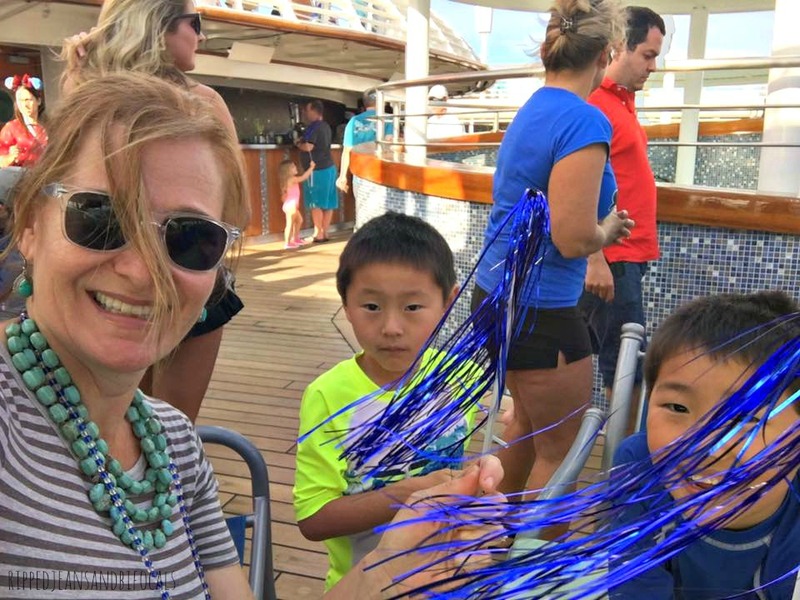 If you’re the type that suffers mom guilt for “dumping” your kids while you go have fun, you will feel good about letting your littles enjoy the kid’s activities on a Disney cruise. When you go to pick your kids up to take them to dinner and their face falls when they see you, that's when you KNOW they're having a great time. One of the COOLEST things about the Oceaneer Club is that it moves to Castaway Cay when the ship stops at that port. They have an awesome sand play area, playground and splash pad. I mean…duh, right? The Navigator (either the app or the newsletter version) tell you when and where the characters will be available for meet and greets. The Disney characters are wearing nautical garb on board – except for Pirate Night where they’re dressed like…wait for it…pirates. If you happen to catch the characters on Castaway Cay they’ll be in their swimwear. So cute! Our sailing offered the opportunity to meet Mickey, Minnie, Donald, Daisy, Goofy, Pluto and Captain Hook. 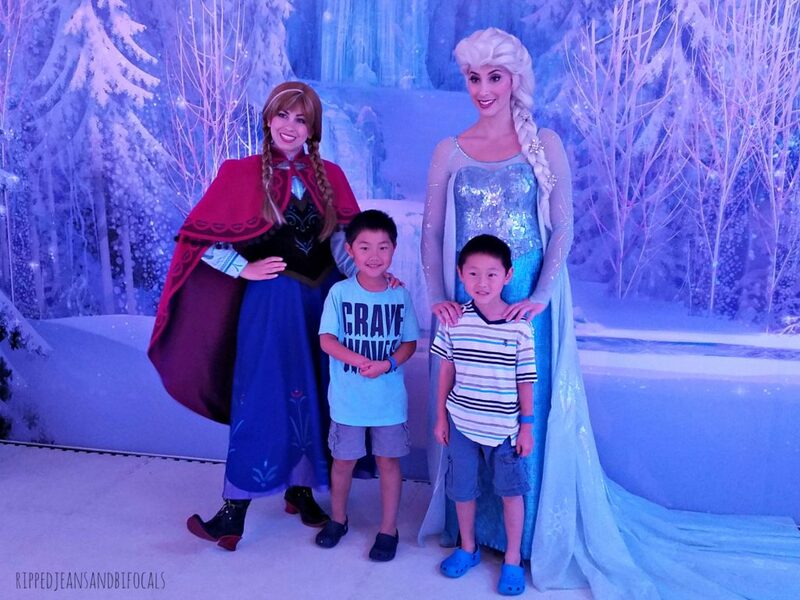 Meet and greets with Elsa and Anna from Frozen and the Disney Princesses must be reserved…there is no charge but you must book your spot in advance. I recommend reserving before you sail. We also got to meet Tiana and Louie the Alligator from The Princess and the Frog in the restaurant Tiana’s Place. They don’t sign autographs in the restaurant but they do offer photo opportunities and Tiana will stop and chat with you while you’re dining. She wears her flapper costume in the restaurant and her princess dress at the princess meet and greet. 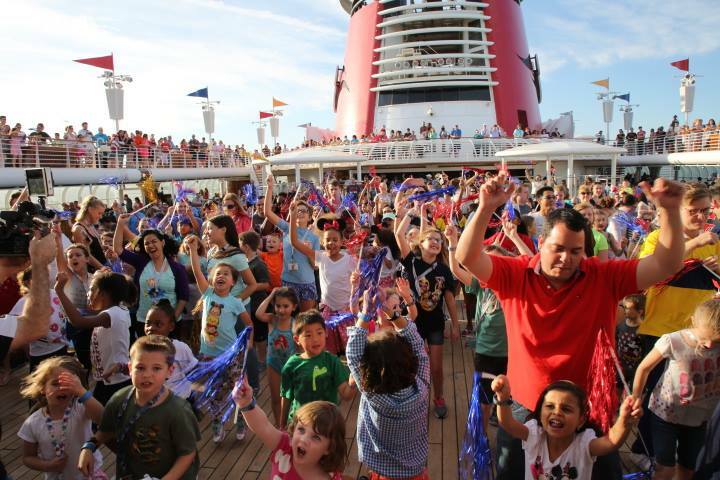 If you think a Disney Cruise is just for kids, think again. There’s an entire adults-only pool area plus an after-hours adults-only area with three different bars. Our favorite was the Cadillac Bar. Our sailing’s Pirate Party was the second night. The festivities started on deck at 10 p.m. with music, characters and dancing but many people were in their pirate gear for dinner. It’s fun to see how creative people get with their costumes. Also, decorating your door on a Disney cruise is totally a thing and it's part of the fun. The best part of the pirate night was the fireworks at sea. They were awesome. 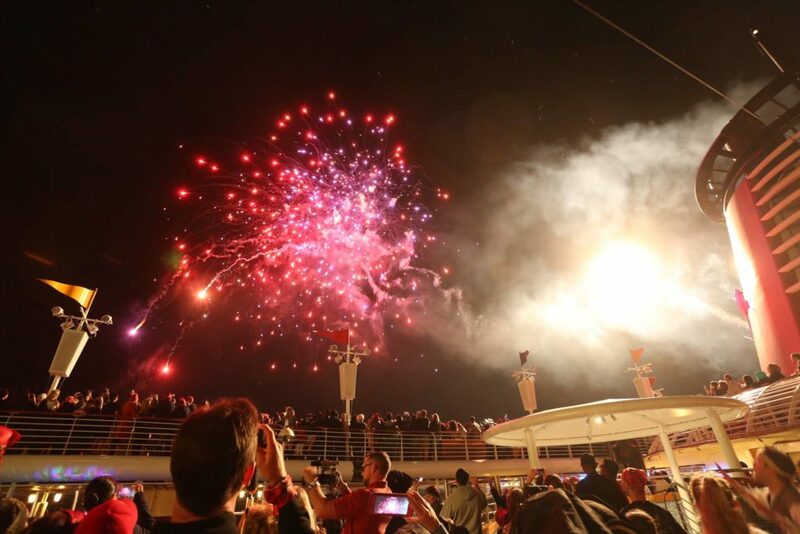 Disney is the only cruise line that does fireworks at sea and they did not disappoint. Fish extenders is an on board gift exchange. It’s not an official DCL activity but a walk through the hallways will tell you it’s a tradition that’s alive and well with passengers. The hook outside of each stateroom is shaped like a fish. If you’re participating, you’ll hang something on your fish to hold small gifts from other passengers. If you’re crafty you can make your own or you can do what I did and order from Etsy. There are no rules for what your fish extender has to look like – I saw quite a few ordinary shopping bags. You’ll sign up with a fish extender group prior to sailing. Groups are limited to ten cabins. 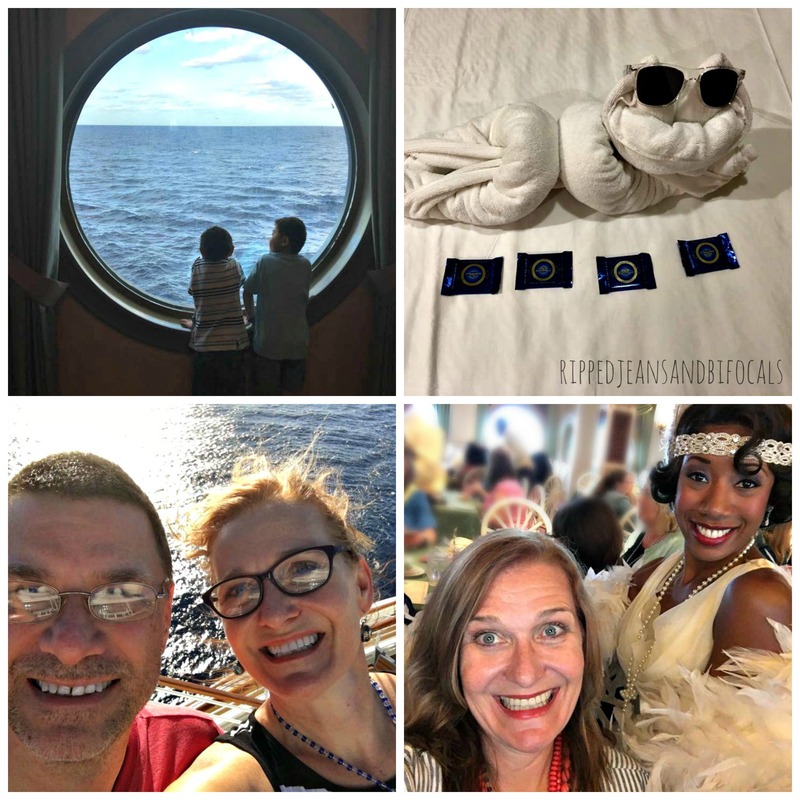 You’ll typically fill out a spreadsheet with a little bit of information about who is staying in your stateroom (names, ages, favorite Disney character, allergies, etc) and then you’ll buy or make gifts for your fellow travelers. It’s sort of like a secret Santa at sea. It was a lot of fun but a lot of work to get the gifts together. It was also a lot of extra stuff to carry on and off the ship and we were so busy during the cruise that we didn’t take time to fully scope out all of our loot until we got home. I was touched by the thoughtfulness of the gifts and wowed by the creativity but I’m not sure if I’d raise my hand to do the fish extender thing on our next Disney Cruise. 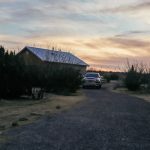 Whether you do it or not, it’s fun to check out all the cool and creative things other people do to make their cabin stand out. There are three shows on the Disney Wonder: The Golden Mickeys, Disney Dreams – An Enchanted Classic, and Frozen – A Musical Spectacular. Disney really crams in the entertainment on a three-night cruise, so there’s a show every night. If you take a longer cruise, you’ll still get the three shows but you can move at a less frenzied pace and check out some other entertainment. We didn’t see the Disney Dreams show but we did catch The Golden Mickeys and Frozen, which were Broadway quality. We also had the chance to see Beauty and the Beast on the Disney Dream. As usual, we were completely wowed. If you sail on the Disney Magic, you'll get the chance to see Tangled: The Musical, which is Disney Cruise Line's newest musical shows. No photography is allowed during the shows. All of your food and entertainment are included – even sodas. You can order a second or even a third dessert in the restaurants (ask me how I know) and if you don't find exactly what you're looking for on the menu, just ask and your servers will find a way to make it work. Fireworks at sea. As much ice cream as you can eat. Twice daily turn-down service in your stateroom. The beaches and amenities on Castaway Cay. Wake up calls from Mickey himself. Room service. Let me tell you, there just aren't words enough to describe the cool factor of ordering warm cookies and milk every night before bed. Other than a select number of dining experiences and some of the extra activities on Castaway Cay (snorkeling, scuba, etc) there all of the fun was included in the price of the cruise. The relaxing fun of a cruise combined with the magic of Disney is something I can't properly put into words. No matter how old you are, there's just something about a Disney experience that puts a smile on your face and makes everything just that much extra-special. I am so jealous! This looks so incredible. I have never been on a cruise, but I think I could dig it, hahaha! I said very un-PG things when I saw that first plate of food…yurm. Oh my goodness, this look like such an amazing time! Your kiddos look like they had a blast! I was invited this year too! It sounded like so much fun, but I couldn’t pull off another vacation after going to Disney World this past summer. This is all really useful to know though, in case I go in the future. Omg looks like you had a total blast! I was so jealous looking at all of this years social media moms pics!! My hubby started a new job in December and can’t take his first vacation until May so we couldn’t go :(:( a Disney cruise would be so fun to take! One of the only major us cruise lines I’ve never cruised on! It looks like so much fun, and the food looks delicious! That sounds like so much fun, my kids would go bananas! One question. Is this something you would take a toddler to? Or would you leave him behind with the grandparents and bring him next time? You can totally and easily take a toddler! 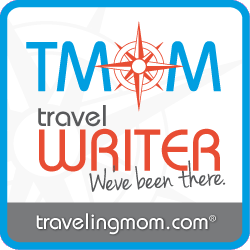 This is so helpful and so timely for us as my husband and I wanted to book a trip to World in the Spring and a cruise in the fall. Thank you so much! Cruise aren’t for everyone but most people do really enjoy them. It’s funny, one of the biggest barriers to cruising is for people to actually take their first cruise. The feeling you get when they hold your family at the door of the ship and then announce your arrival to everyone…that is one of the most magical moments of life. 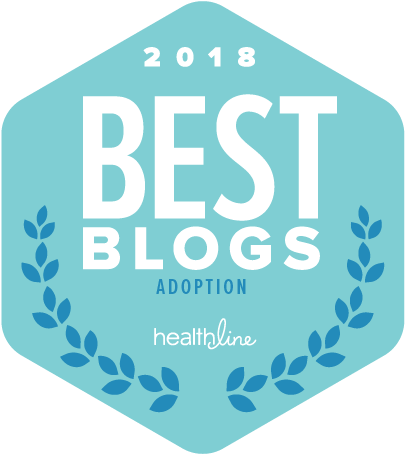 Great write up! We had a blast on the Disney Dream. 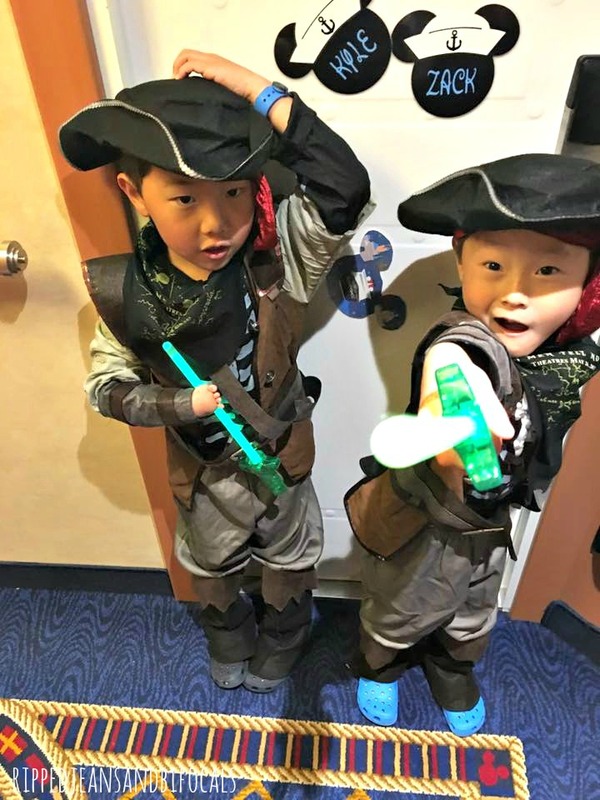 Our boys loved the pirate party too! And WE loved the childcare and the adults-only restaurants! Great to see your pictures, makes me want to go back! OMG, the food looks absolutely amazing. That’s always my favorite part of the entire cruise experience. Keep up the great work! Seems like You had enjoyed alot. Hope we get chance of going there sometime. 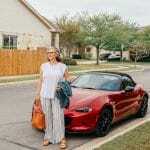 Enjoyed reading your post keep sharing. Cheers.!!! Sooooo jealous! 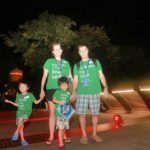 In the last 10 years, we have taken 2 cruises, but we have not had the opportunity to take a Disney Cruise yet. It is on the list, and the more we read about how amazing they are, the more we want to go! 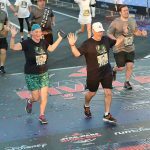 Thank you for sharing this amazing experience!